Lucky Day was a re-strand, meaning she was rescued on two separate occasions, and she spent a total of almost two months recuperating at the Center - waiting for her lucky day until she was well enough to return home. Lucky Day was released on January 10, 2011, along with two other California sea lions: Nantucket and Frostbite. Lucky Day had been waiting patiently for a lucky day of her own. Rescued not once, but twice by the Center, coupled along with her poor body condition and malnutrition made her story a longer one. Fortunately, though, it has a happy ending. Originally admitted to The Marine Mammal Center on October 1, 2010, Lucky Day, a female subadult California sea lion, was first rescued at Seacliff State Beach, below the visitor center in Aptos, Santa Cruz. When Lucky Day was found, she was in poor shape, exhibiting depressed behavior, inactivity, and suffering from a heavy discharge from her closed, right eye. Subsequently, she was diagnosed with pneumonia and sacrocystis (a parasitic protozoa that compromises muscle tissue) by the Center’s veterinarian team. After about a month of care, Lucky Day’s health improved. Her eye healed, and she was eating well. She had even gained enough weight so that veterinarians felt comfortable she would survive in the wild on her own. She was released back into her ocean home at Point Reyes on November 8, 2010. However, just ten days later, Lucky Day stranded again on November 18, 2010. This time she was found lying in the middle of Potbelly Beach Road, near Capitola's New Brighton State Beach in Santa Cruz County. She was lethargic, and looking very down. In fact, she was emaciated with most of her ribs showing from malnutrition. Lucky Day had lost over 40 pounds during her time at sea swimming all the way from Point Reyes to Capitola. 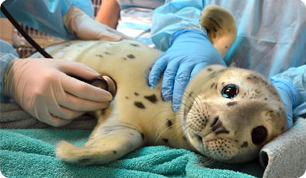 The Center re-admitted her to the hospital and began treatment for both her malnutrition and sarcocystis. Over time, Lucky Day's strength increased and eventually veterinarians determined that she was ready to be released once again. On January 10, 2011, the Center released Lucky Day at Weston Beach, Point Lobos State Preserve, in Monterey County. She was released along with two other California sea lions, Nantucket and Frostbite. Nantucket is a male yearling admitted November 16, 2010, from Lover's Point in Monterey County. He was treated for malnutrition and trauma. Frostbite is a male yearling admitted November 28, 2010, from Fisherman's Wharf in Monterey County. He was treated for malnutrition. The Center released Lucky Day, Nantucket and Frostbite together into the Pacific Ocean. We hope this time Lucky Day's name protects her and she will remain a part of the ocean community and not need to be a patient at the Center again.